NEW YORK — LeBron James drove left, the No. 4 scorer in NBA history needing a basket to beat the worst team in the league. The Lakers led by 11 with under 3 1/2 minutes remaining before the Knicks charged back largely because of their defence against James. 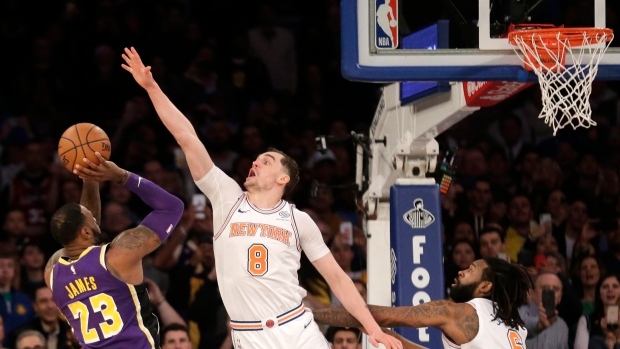 DeAndre Jordan also blocked one of his shots in the final minute, and James also missed a jumper with the Lakers clinging to a one-point lead. "But what's the difference between their record and our record? Two teams out of the post-season. So it's no difference. We could have a couple of more wins than them but both teams right now are looking on the outside looking in." James' trip to one of his favourite arenas was his first in a long time where his team has no championship hopes, where instead of All-Star teammates, his Lakers had as many mismatched parts as the Knicks. James got the usual big cheers for an exciting play, but also the type of criticism he has rarely faced during his career. The Knicks made 11 of their 15 shots, and even when they missed it wasn't because of great Lakers defence. Of their four misses, two were unsuccessful dunk attempts by Jordan.